US credit ratings agency Moody’s has put the UK on negative outlook, meaning it thinks there is more chance the economy may lose its triple A status. France and Austria, who also share a top triple A rating, have been similarly graded. Italy, Spain and Portugal’s ratings have been lowered. Moody’s blamed the eurozone crisis for the adjustments. The UK chancellor remains committed to his policy of austerity whilst the opposition warns this could backfire. The negative outlook for the UK means Moody’s thinks there is a 30% chance of a downgrade within 18 months. BBC economics editor Stephanie Flanders said there was no suggestion that the agency would prefer the UK government to change its economic policy of austerity. Now, I believe that the idea that a Western government bond can today be a AAA investment is very dubious. Simply, the current phenomena of negative real interest rates and debt saturation, and the problems of deleveraging mean that it is very unlikely that an investor in government debt will get back their purchasing power: either by inflation, or by default, most such investors in the next decade will probably lose the skin on their noses. But that is a side issue. Since David Cameron and George Osborne announced their policy of austerity, my thinking on fiscal policy has somewhat evolved. Given that we know that a high residual debt load has a damaging effect on growth, my view has always been that we need to reduce the debt load as fast as possible. The question was always how we should best go about doing so. I knew from the beginning that there was always a danger that in an economy already dependent on high government expenditure, fast and hard cuts — especially in an already-depressed economy — would probably lead to a contraction in tax revenues, thus producing higher deficits and less debt reduction. Furthermore, because of the high residual debt load, cuts in spending would merely go toward paying down debt. This means that the government will still be sucking just as much capital out of the economy as before. While cutting taxes might prove a huge plus , the presence of a huge debt load means tax cuts will be unaffordable, and thus there would be no such boost. Bruning applied the [austerity] medicine to Germany, and the resulting backlash was so intense he suspended parliamentary democracy and ruled by emergency decree, setting a fine example for the next guy who took power. After just two years of “austerity” measures, Germany’s economy had completely collapsed: unemployment doubled from 15 percent in 1930 to 30 percent in 1932, protests spread, and Bruning was finally forced out. Just two years of austerity, and Germany was willing to be ruled by anyone or anything except for the kinds of democratic politicians that administered “austerity” pain. In Germany’s 1932 elections, the Nazis and the Communists came out on top — and by early 1933, with Hitler in charge, Germany’s fledgling democracy was shut down for good. Of course, in the modern world there is a larger problem even beyond fiscal contraction leading to a contraction in real output. This is the problem of fiscal contraction leading to financial collapse. Simply, as Greece have enacted more and more austerity, they have collected less and less taxes. And this means that they are closer to closer to default. Now, because Greece’s debts have been securitised and spread around the European banking system, a default on Greek debt could lead to mass bank insolvencies in European, which could lead to mass bank insolvencies around the world as more and more counter-parties default on their obligations. As we learned a long time ago, big defaults on the order of billions don’t just panic markets. They congest the system, because the system is predicated around the idea that everyone owes things to everyone else. Those $18 billion that Greece owes might be owed on to other banks and other institutions. Failure to meet that payment doesn’t just mean one default, it could mean many more. That is known as a default cascade. In an international financial system which is ever-more interconnected, we will soon see how far the cascade might travel. This is a bizarre situation. The intuitive response to excessive debt — belt-tightening; spending less, and saving more — is not only wrong, but it is potentially dangerous. Modern Keynesians believe that the answer to these problems is stimulus and monetary expansion: that government ought to increase spending, and that monetary authorities ought to print more money. Essentially, both of these ideas amount to reinflating the bubble. Stimulus allows for the economy to keep ticking over while the private sector deleverages. Money-printing and inflation shrinks the debt relative to the amount of money in the economy. There is a real advantage here: bondholders — as opposed to taxpayers — take a hit as their lendings are repaid in debased currency. As I have noted in the past, I believe (as did Jesus) that creditors are the ones who ultimately must take the hit when it comes to addressing the problem of debt saturation. After all, in a market economy, all investments — even those made to very wealthy debtors — carry risk. Unfortunately, the inflationary Keynesian method hits savers and investors, and those living on a fixed income. Worst of all, these aids ignore the real problem, which is not the recession at all, but the thing that caused it — the huge preceding credit-fuelled bubble. And therein lies the problem. Economic history can be broadly divided into two eras: before Keynes, and after Keynes. Before Keynes (with precious metals as the monetary base) prices experienced wide swings in both directions. After Keynes’ Depression-era tract (The General Theory) prices went in one direction: mildly upward. 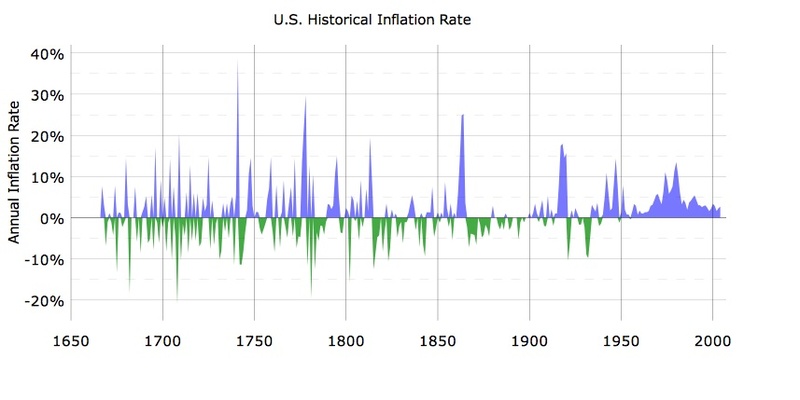 Call that a victory for modern economics, central planning, and modern civilisation: deflation was effectively abolished. The resultant increase in defaults due to the proportionate rise in the value of debt as described by Irving Fisher, and much later Ben Bernanke, doesn’t happen today. And this means that creditors get their pound of flesh, albeit one that is slightly devalued (by money printing), as opposed to totally destroyed (by mass defaults). The aggregate effect of the Great Depression was the erasure of private debt by the end of World War 2. This set the stage for the phenomenal new economic growth of the 50s and 60s. But since then, there’s been no erasure: only vast, vast debt/credit creation. And that is the real problem we face today: the abolition of deflation, the abolition of small defaults, the abolition of the self-correcting market. 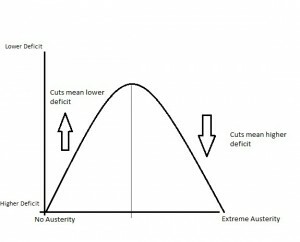 Neither austerity, nor stimulus are a sufficient remedy for today’s financial problems (let alone today’s economic ones). What is needed is liquidation, so that the old rubbish is cleared out, the system is no longer congested by debt saturation, and new opportunities are opened up. Simply, everything we have experienced over the last twenty years — from Japan in the ’90s, to America in ’08, to the ramifications of Greece’s default, to the growing trade war between America and China — is a lesson that credit-based money is not robust. It is so weak to the problem of credit contraction that — once the point of debt saturation is inevitably reached — every time there is a contractionary event, monetary authorities must pump the market with new money, and highly-indebted governments must (unless they are foolish like Britain’s present government, and want to see falling consumer confidence, business confidence, real GDP, industrial output, and productivity) maintain or increase spending instead of reducing spending and saving money. Otherwise, the system itself is endangered. It is a fundamentally fragile system. Ultimately, nature always wins. Ultimately, the debt saturation problem will be taken care of either by currency collapse, or by defaults (and probably systemic collapse, and a new global financial order), or by war, or by some kind of debt jubilee. I don’t know which. I hope for the latter. It seems kinder. This entry was posted in Current Affairs, Economic History, Economics and tagged argentinosaurus, austerity, britain, credit bubble, david cameron, debt-based money, default, depressed economy, ed balls, fractional reserve lending, paul krugman. Bookmark the permalink. ← A Time for War? A nice summary of where we are, why we are here, and what might be the best way forwards. However, when I look at the real world around me it is clear that all central banks, and all Western governments, are not interested in the truth. In fact they suppress it and follow the keynesian path with enthusiasm, lying continously to us about the state of our economies, and refusing to discuss any long term policies to achieve debt repayment. Is this situation due to ignorance and stupidity? Politicians and economists may be many things, but on the whole I don’t think they are stupid. Is it fear, corruption, or self preservation on their part? One or all of these is more likely. After all, what’s the point publicly telling the truth and destroying your employment prospects because people will refuse to vote for you as a conseqence, or accuse you of being negative, unpatriotic, or even a terrorist. It’s good to see suggestions such as a debt jubilee mentioned here, but I don’t see such radical ideas gaining traction short of a major financial collapse. More likely any financial crisis will be (is being?) gleefully seized upon to centralise power in fewer hands. Sorry to be so negative, but the future seems to me to be clearly mapped out. Only the time scale remains unknown, and there is some cause for optimism here. In my experience, future scenarios usually take far longer to come about than we imagine when we first formulate them, and a lot of white and black swans will come along in the meantime, so at least the future isn’t set in stone. I think the words “financial crisis” are a contradiction. Bernanke has proven that we can just print more money and go on our merry way. The only real crisis would be when the system of global trade breaks down, as a result of currency collapse or one of the various political complexes. At that point, power being centralised will be almost irrelevant. I’m coming round to your view, Aziz. If the country has a printing press, the idea is not far fetched! That’s because rating agencies only care about the repayment of the agreed upon original amount of money. Weimar Germany could have been rated AAA. The only risk is default. Well, they will, but so will the defaulting country absent humanitarian aid or some other aid of some kind. If some country lived beyond their means, and if no one is willing to lend them money anymore, it’s a mathematical fact that their standard of living will not be supported anymore. The creditors will have taken their hit, but the country is still left in disarray. Depending on the degree of dependence upon debt, the country might not even have money to buy basic medicines. That’s why sometimes, a hard default may be a bad idea for the defaulting country (even though some would be satisfied that the creditors have taken their hit). PS: I understand your idea of a jubilee would be kind of like “having your cake and eating it too”. That is, debt outstanding is erased, but the flows of debt continue just like before. I can never, ever see this happen because simply no one on the creditor side will agree to something like this. If this jubilee is to be made acceptable, then it needs to include elements related to fixing/stabilizing the system. An example of such an idea: revaluing gold to pay the debts would be kind of like a jubilee except that once the gold will be shipped from west to the east, the ball will be in the court of the creditor nations – i.e. they will be forced to use that gold to purchase “products” from the former debtors so the trade imbalances will be forcefully resolved. Also, theoretically, the debts have been paid in full because gold will have roughly the same purchasing power except that the creditor nations will have to use it to buy “products” from the former debtors. “they will be forced to use that gold to purchase” -> The mechanics of this are more delicate but roughly I understand this process like FOFOA. I’m not saying that this is what should be done, I was merely trying to propose a more workable kind of jubilee. A bit long winded, but well thought out. An example of such an idea: revaluing gold to pay the debts would be kind of like a jubilee except that once the gold will be shipped from west to the east, the ball will be in the court of the creditor nations – i.e. they will be forced to use that gold to purchase “products” from the former debtors so the trade imbalances will be forcefully resolved. Yes, this (or something similar with other physical resources or perhaps even equities) would work. I never said I expected the creditor side to take a straight loss. The idea that old-fashioned debt deleveraging can be successfully done is very, very difficult, and perhaps impossible. The necessity is that the debts are extinguished. Because, the other alternatives (default, trade war, hyperinflation, currency crises) are not very rosy looking for the big picture. We just have to wait a couple of more years. By then, the banksters will have stolen anything not nailed down and fled town. Only then, will the system be allowed to crash. Same as it ever was. The Ceridian-UCLA Pulse of Commerce Index fell 1.7% in January. The index uses real-time diesel fuel consumption data for over the road trucking. Ed Leamer, the lead economist, commented in the press release that Pulse of Commerce Index was not matching other economic data points, such as Industrial Production, Real Retail Sales, increase in payroll jobs and the decrease in initial claims for unemployment. Of course Mr. Leamer has yet to understand (or is willfully ignorant) that the economic data is manipulated and does not reflect the real world as their index PROVES! The old trucking fleet is being continually improved. Efficiency is increasing. There are new electronic devices that monitor driver behaviour. This results in lower diesel use. In Australia we have trucks that pull 3 trailers on major highways. This results in massive fuel efficiency. It is difficult to use these statistics unless you understand the key trends. The problem I have with Government Planning is they have bureaucrats who don’t have the experience or understanding that a private firm has. Business owners at the coal face make rational profit decisions based on their immediate circumstances. Untill we abolish selfish politicians (Spending for votes in good times and bad, thus ruining Keyne’s theory) and selfish bureacrats (decisions that favour their employment prospects and not the economy/business people that are effected by their decisions) the world economy is doomed. I note the online newspapers in my home town. Matters of economic debate and importance got 2 views (Including myself) versus 1400 odd viewers online. Whitney Houstons death received over 400 ( I was curious to see how many were reading!) In a country where people are forced to vote, that makes me quite concerned, they are voting in a totally uninformed and dangerous way. The PCI fell 1.7% in one month(Jan). I don’t believe that this drop can be attributed to gains in efficiency. Agreed, but the trend is down, and sales are up on a trend, therefore energy use to $ sales implies greater efficiency. I can’t seem to get my discounted cashflow model to work! The NPV is zero??? I usually put in a AAA Government bond rate as the risk free rate. When I add in other factors the model is saying I should not invest. How can I make a business investment decision?? I thought about the heading “The system is the problem”. If Economics is a “Social Science”, then perhaps the Social side of things is the problem. 1. Who makes long term decisions using a moral framework? 2. What happened to hard work, and saving for an item that you really want/need based on real utility? 3. Who hires people and treats them as a human being and an asset of the company, instead of a human resource/expense? 4. Who appreciates the risks their employer/boss is taking, and gives their best to the company? 5. Do you ensure you make a quality product or service that you would sell to your friends and family? 6. If you lend to someone, do they understand the true costs of the transaction.Are you taking advantage of them, with usurous rates of interest and hidden fees? 7. If you borrow do you honour your debts and build a credit history worthy of being lent to inthe future. If you fall on hard times do you negotiate with your lender, and stick to an agreed plan? 8. If you are a Politician, do you keep your word when lobbying voters and voting for legislation. Do you abuse your position of power? 9. If you are a voter do you understand the issues you are voting for and do you vote in a self interested way, or vote for Politicians that care about your and your future families future? 10. If you are an Economist, do you recommend policies that support your selfish interests (Employment, Reputation amongst peers) or ones that will improve society. The above choices made by people can mean Anarchy or Monarchy/Dictatorship. You can either be controlled by your parents or leave home and flourish as an individual.